EVEN as the Americans strive to jump-start fresh talks between Israelis and Palestinians, the Israeli government has been using the hiatus to intensify the refashioning of East Jerusalem, which the Palestinians see as their future capital. This week the city’s Israeli mayor, Nir Barkat, unveiled his latest plan to turn Palestinian districts into Jewish biblical heritage parks. Fearing that their half of the city is being cast in an increasingly Israeli mould, Palestinian stone-throwers clashed with Israeli forces on the Haram al-Sharif, or Noble Sanctuary, which Muslims venerate for its al-Aqsa mosque, Islam’s third-holiest shrine, and which Jews revere as the site of the biblical Temple. While George Mitchell, Barack Obama’s envoy, is yet again bidding to open “proximity talks” between the two sides, the Palestinians have been literally losing ground. Unlike previous Israeli prime ministers, who built on the open hilltops above Arab population centres in the West Bank and on the edge of Jerusalem, Binyamin Netanyahu and his officials are concentrating on Jewish settlements bang in the midst of them. Car-parks and conservation areas, rich with Israeli symbols, are sprouting across East Jerusalem. Settlers with state protection are opening religious schools there. Scarcely a week passes without an Israeli newspaper heralding new Jewish housing units being built in Arab districts. Israeli archaeologists are scraping away the eastern parts of the city’s Arab surface in search of a Jewish past. Last month one of them declared she had “probably” found King Solomon’s city walls. Inside the Old City itself (see map), the Israeli government’s East Jerusalem Development company has begun to interrupt the main Palestinian artery into the ancient centre, for sewage works. Mr Barkat says the project will improve services, but Palestinians fear it presages fresh archaeological digs aimed at exposing Jewish ties along the pilgrims’ route to the Temple that Jewish groups from the religious right seek to rebuild. To fulfil millennial Jewish yearning to restore the tabernacle, the company is also repairing what it says are ancient ablution pools. Beneath the Old City’s Muslim quarter, the company says it will open its extension to 9,000 square metres of biblical quarries this summer and could yet link them to other subterranean routes, giving Israelis and tourists access from one end of the Old City to the other without having to pass an Arab or the trinket shops on which many Palestinian traders in the city depend. The digging feeds Arab fears that Israel is eroding the very foundations on which the Arab districts, and in particular the al-Aqsa mosque, are built. Parts of Silwan, on the eastern slopes below the Old City, are already precariously propped up on iron stilts, to facilitate the excavation of King David’s biblical city, which is said to lie beneath. A settler outfit called Elad has turned the site into Israel’s third-largest tourist site and is laying Jewish heritage trails through the adjoining valleys. Can the Palestinian Authority, which runs a fledgling state on the West Bank, do anything to salvage its putative capital, other than plaintively cry “theft”? Efforts to rouse international ire have had mixed success. Last year America’s secretary of state, Hillary Clinton, berated Mr Barkat for his plan to demolish Arab homes to create a biblical tourist park in the valley below the Old City, where David is said to have composed his psalms. Wary of a foreign outcry if the bulldozers move in, Mr Netanyahu has publicly asked Mr Barkat to slow down. But Mr Barkat seems unfazed. The Palestinians are ill-equipped to bar the encroachment. In 1996, when he became prime minister for the first time, Mr Netanyahu’s decision to open a tunnel alongside the al-Aqsa compound sparked a Palestinian uprising that left scores dead. Since then, Palestinian clout in the city has eroded. 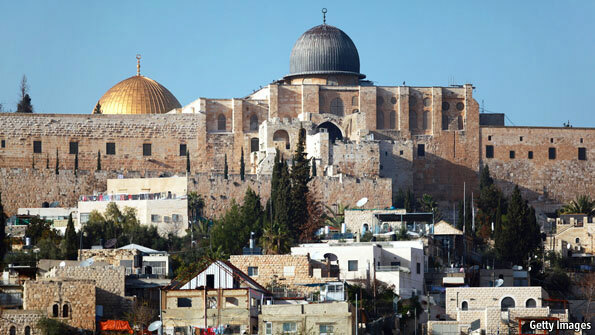 Whereas Palestinians recently cried foul when Mr Netanyahu added two shrines in the West Bank that are holy to Muslims as well as to Jews in his latest list of Israeli heritage sites, they hardly stirred when he included David’s City, which is in East Jerusalem. One reason for the apparent futility of Palestinian dissent is the Israeli security barrier that bites into the West Bank and runs through chunks of East Jerusalem. It prevents most West Bank Muslims from reaching the city’s holy places and has cleft its Arab districts in two, leaving tens of thousands of Arab residents on the wrong side. Further impeding access, traffic lights flick green only briefly for cars from Palestinian districts while staying green for cars from Jewish settlements for minutes. And Israel’s interior ministry is stripping ever more East Jerusalem Palestinians of residency papers. In 2008 nearly 4,600 lost them, 20 times the previous years’ average. Severed from its West Bank feeder towns, Ramallah and Bethlehem, Arab East Jerusalem at night feels like a ghost-town sunk in neglect. The climb up Silwan’s hillside stairways is a tricky obstacle course. The streets are littered and broken. Streetlights have long ceased to work. Israeli gendarmes cruise past in military vehicles, but Israeli ambulances have sometimes been told not to venture into Palestinian areas to answer emergency calls. Jewish cemeteries on the east side are pristine whereas the few Muslim ones in the west lie desolate. Some say Bill Clinton, when negotiating as president in the late 1990s, unintentionally speeded Israel’s encroachment. What is Jewish would stay Jewish, he said, and what is Arab would stay Arab. Instead of cementing the status quo, his words may have spurred Israel on to establish “facts on the ground” before someone calls a halt or negotiations begin anew. Readers have commented on this article (the window for new comments is now closed). Want more? Subscribe to The Economist and get the week’s most relevant news and analysis.